FREE Online CPR & First-Aid Classes. Start Your CPR Certification Training Today! "CPR certification and training online has never been easier." Certification training with efficiency in mind. Discounts - Limited Time Offer (see below). Free CPR Training. Pay After Successfully Passing Your Test! The Guarantee? Certification Acceptance or Your Money Back! Our curriculum has been developed by American Heart Association (AHA) trained providers with hands-on experience. Free Shipping & Handling (no hidden costs). *Results of one account, actual results may vary. Get proof of certification immediately after a passing grade with a secure PDF and email copy. Also, receive your hard card in the mail within 2-5 business days. When you need quick proof of CPR certification, First Aid, BBP, or BLS certification online, our e-learning center features a practical way to study and test in hours (or less) vs. days. Benefit from no lengthy commutes to the classroom with test prep, study guide materials, certification / renewal courses that are accessible online. CPRHeartCenter is in the business of problem-solving, just like you. We recognized a long time ago that professionals in education and healthcare shared one thing in common, which is to safeguard that proper measures were in place to respond to medical emergencies – hence the need for First Aid certification or CPR certification. From first-timers to veterans, our platform offers a simple and practical way to get equipped with the knowledge and credentials required by the workplace. We cut out unnecessary filler materials and solely focuses on the most critical aspects of the public health and safety. In other words, we equip you with practical knowledge for responding to real-world emergencies. All our courses have been planned and proofed by reputable American Heart Association (AHA) trained healthcare professionals who have hands-on experience in the subject matters available. Get unlimited access to industry-leading public health and safety courses around-the-clock. Whether you’re a night owl or early riser, our platform offers a flexible way to earn a certification or recertification – based on your preferences. CPRHeartCenter caters to busy professionals who have limited time to sit through on-campus learning centers. Study and prep for the final test during a lunch break or on a train commute to work, for example. The courses can be taken on-the-go and on any type of device. We’ve taken the fear out of testing by offering unlimited retesting with no penalties or extra cost to you. Also, users are free to take advantage of the complimentary training materials available. We’ve thought of everything to simplify the certification process. Your search for a high-caliber e-learning center ends here. Not only do we offer comprehensive online CPR training classes / courses, all prep work and testing can be completed on your terms. The flexible set up allows you to study and take the final test at a time that fits into your busy schedule. Don’t let your heart skip a beat if you fail the preliminary exam. With us, you can keep calm and carry on with unlimited test retakes – at no added cost. There are no wait times for retakes either, and you’ll even see the highlights of incorrect answers before proceeding. Our online CPR certification or CPR recertification is for non-healthcare providers. Learn implementation procedures for basic CPR (for adults, children and adolescents) and how to use an AED. Or, skip to our free CPR test. In our online First Aid certification or First Aid recertification you’ll learn the basics of preventing further injury and preserving life. Learn all about treating wounds, burns, fractures, bleeding, and more. All the basics are covered for prepping you to potentially save lives. Or, skip to our free First Aid test. Our online CPR & First Aid certification or CPR recertification is for non-healthcare providers and teaches proper implementation procedures for basic CPR (for adults, children and adolescents), how to use an AED, and First Aid basic for preventing further injury and preserving life. You will learn all about wound treatment, burns, fractures, bleeding, and more. Or, skip to our free CPR & First Aid test. Mitigate our online Bloodborne Pathogens certification or BBP recertification and the risky business of providing aid to others facing a life-threatening emergency by learning the proper steps to take for preventing the transmission of disease. Our BBP course focuses on protocols for protecting first responders from exposure to viruses, bacteria, and parasites. Or, skip to our free BBP test. Our online Healthcare CPR certification or Healthcare CPR recertification is designed to provide a wide variety of healthcare providers the ability to recognize many life-threatening health and safety emergencies, provide CPR, use an AED, and relieve choking. Or, skip to our free Healthcare CPR test. Start the online BLS certification or BLS recertification to learn life-saving methods for treating individuals with serious injuries. This course is recommended for professionals in the healthcare industry as well as anyone interested in improving public health and safety. It will cover CPR (adults, children, and infants), AED, First Aid, and Bloodborne Pathogens. Or, skip to our free BLS test. We deliver continuous support and training materials for up to two years after issuing a certification or recertification. This time frame reflects the validity period of all certificates delivered. The purpose of this access to online training modules is to provide an easy point of reference – if and when you forget what to do. Contact Us for timely updates or answers to your most pressing questions from our friendly customer service team. We pride ourselves in offering fast and simple solutions to any hiccups that may arise. Get assistance with group discounts or trouble signing up, for example. We’re ready and willing to help in any way we can. For your convenience, we accept all major credit cards for certification and recertification courses, including Visa, MasterCard, Discover, and American Express, as well as payments through PayPal. We value your privacy and have implemented Secure Sockets Layer (SSL) Certificates at every payment gateway. Get instant proof of certification or recertification acquired through CPRHeartCenter. After receiving confirmation of a passing grade (on the computer screen), follow the prompts to print out the PDF version of the certificate sent to your email. This certificate is accepted from coast to coast and it includes your name, course name, date, ID number, as well as the instructor’s name and signature. Expedite your learning and training with us and get CPR certified today! At CPR Heart Center we offer certification classes for Workplace Employees, Healthcare Providers and the Community. We’re accepted by thousands of companies and institutions and trusted by hundreds of thousands of Professionals across the United States, Canada, and Worldwide. 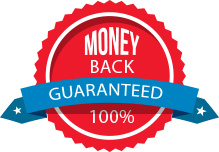 All certification classes include a 100% risk-free money back guarantee. If your certification is denied for any reason, our team will refund your purchase. 100% guaranteed!